I have to agree that this mill is one of the most beautiful buildings in Durham, at least among the large buildings. I don't know of any other major buildings that have such a distinctive and assymetric bend. To me, the only big bummer about the place is that the tower side of the building faces north and is always in the shade. Regarding the Hope VI projects, I do appreciate how the architecture is (to my eyes) fairly appealing and human. I also appreciate how Habitat is putting a small neighborhood in ~2 blocks north of the Hosiery Mill, in the shadow of Golden Belt. Who knows, maybe that small commercial district (sorry I don't know the name but maybe you already wrote about it) may come back to life? Are you referring to the small set of commercial buildings to the east, on E. Main? I haven't written about those yet. Unfortunately, several were torn down by the Hayti Development Corp. a few years ago. I have some beef with Habitat and what they are doing to the Golden Belt National Register historic district (that small neighborhood to the east of the GB factory, built 1900-1930). They gutted the old mill houses down to the studs, (no windows or doors) and left them open for awhile. Reportedly one fell down. I've driven by and taken pictures a few times - it appears they've just replaced all the old mill houses, piecemeal. Ridiculous. I'm no fan of what Habitat does to old neighborhoods (tear them down.) It is quite feasible (and in the long run, more beneficial along economic, social, cultural, and environmental dimensions) to produce affordable housing through rehab rather than demolition and new construction. It's hellish trying to convince a group like Habitat of that, though. That tower looks like it could have been built in Europe 500 years ago. What incredible craftsmanship. I agree - it's a shame that it isn't featured more prominently in media/booster images of Durham. i been inside this building before. I been in this building a couple of times, about 10 years back, and i must say, the inside looks very nice. Do you have any pictures of the inside of the building before was redesigned for housing? I'm sorry, I don't. I've never been inside, actually - I'd like to get a tour of it someday. A little trivia for you. Thomas Atwood originally came to Durham in 1920 as the chief engineer for the Durham Hosiery Mills. He worked there until 1921 when he was hired to oversee all the construction at UNC-CH. He founded the T.C. Atwood Organization and later partnered with Arthur Nash in the 1920s and H. Raymond Weeks in the 1930s to 1943, when he died. The firm later became Harris & Pyne. You've profiled a number of Atwood & Nash and Atwood & Weeks buildings on the site, but figured you might enjoy that little tidbit. What an amazing building, and one that I didn't even know was there. While it's somewhat unfortunate that it doesn't have a more prominent public function, at least it is still intact and in good use. I was a home health nurse in Durham and surrounding areas for 20 years and because of this I have had the privilege of going inside this building. I am a Durham native, but did not travel a lot of areas in Durham until I became a home health nurse. I value the history of Durham and love the fact that old buildings are saved and repurposed. My grandmother who is 100 now lived in the bldg that is closest to the train track for quite a while, she was on the third floor(the highest they went), as far as I knew all the apartments have 14-16 ft ceilings and are beautiful in the morning with the light coming in the windows. She was in the curve like in the the last picture. I always loved going to see her there because we always go to see the train coming by. She moved in when the Goodwill was in the parking lot across the street and she would walk us over there from time to time. In delivering Meals on Wheels I have gotten to see inside this remarkable building. It is really nice with towering ceilings, windows and exposed brick. It give those expensive, yuppie loft apartments downtown a run for their money. I'm glad low income seniors have this place to call home and they seem happy to be there. The Durham Hosiery Company had its beginnings in 1894, when it was organized by George Graham, and began operations in a building on Church St., and subsequently, Morris St. Later that same year, Julian Carr and John W. Smith organized the Golden Belt Hosiery Company (a different entity than the Golden Belt Manufacturing Co.) and located the new company at Five Points, at "the southward intersection of Main and Chapel Hill Sts." Given that the current buildings at that location were built during the 1920s, this building is likely gone. 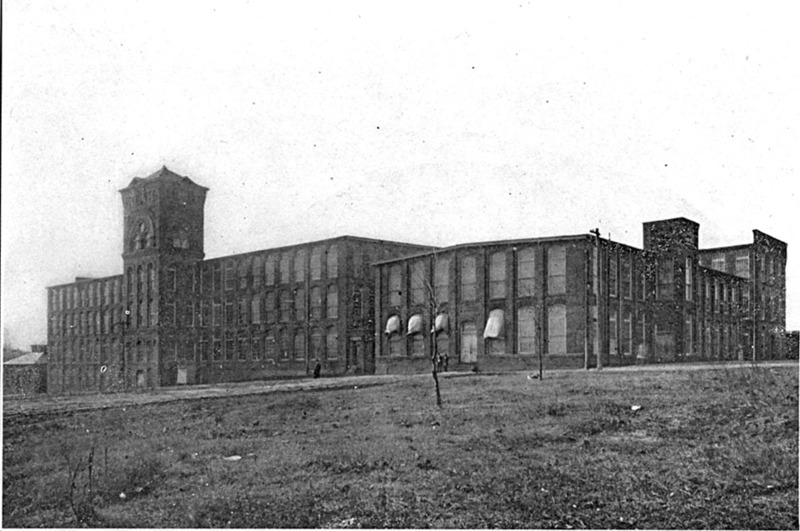 Neither the Durham Hosiery Company nor the Golden Belt Hosiery company could compete with the strength of the northeastern textile mills, and were soon merged as the "Durham Hosiery Mill Company" in 1898. The confluence of the Dingley Tariff act of 1897, which enacted protectionist tariffs for foreign textiles and the Spanish-American war in 1898, which brought new demand, were a boon to the new company, which consolidated at the Morris Street building. Soon, however, the demand necessitated a new structure, and work was begun on Durham Hosiery Mill No. 1, in the still-quite-rural Edgemont community to the east of downtown. Durham Hosiery Mill No. 1, prior to 1905, looking southwest. The dirt road is Angier Ave.
Julian Carr took over management of the business soon after the new structure was completed. Two annexes were completed in 1904 and 1906. Business continued to boom, and by 1907 had 1000 employees operating 11,000 spindles, 64 'cards', and 1000 knitting machines. In 1912, another Annex with a distinctively rounded corner was built at the west end of the complex. 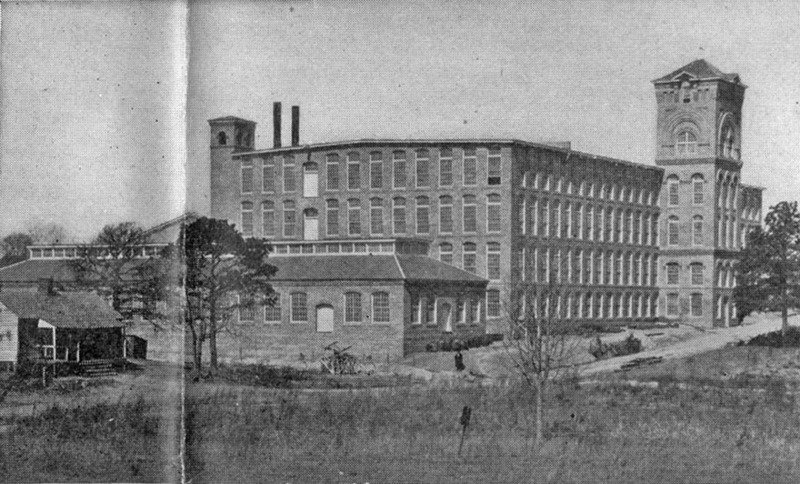 The thriving company had mills no. 2 through 15 as well, including Durham Hosiery Mill no. 4, later renamed Carr Mill, in Carrboro. Durham Hosiery Mills, early 1920s, seen from East Main St., looking south. The triangle of green space between Angier and Main appears to contain a gazebo and a baseball diamond. 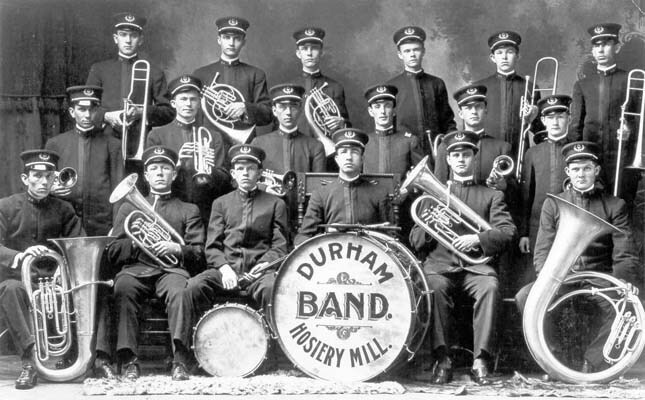 The Hosiery Mills Brass Band, 1910. 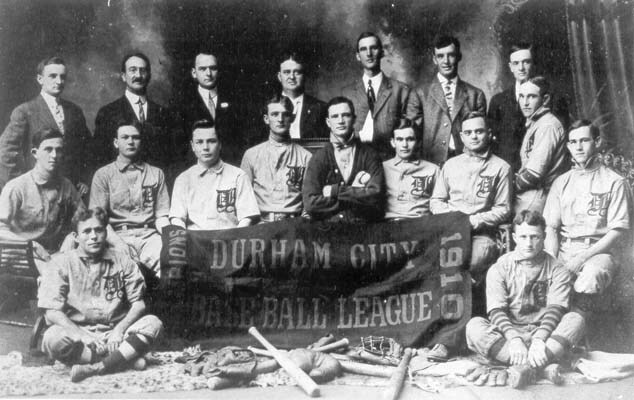 The Hosiery Mills Baseball Team, 1910. The booming business caused growth in the surrounding Edgemont community to the south, which grew towards Alston Avenue in the area once occupied by Prattsburg. Durham Hosiery Mill no. 1, late 1920s/early 1930s. The plant closed in 1934, and the building remained largely vacant until World War II, when it was used by the American Red Cross. In 1946, it was purchased by the Central Leaf Tobacco Company and used as a redrying facility, until around 1960, although a portion of the campus was used as a National Guard Armory during that time. Durham Hosiery Mill No.1, looking south from near East Main St. Durham Hosiery Mill No. 6 is in the background with the large smokestack. Further to the south are the railroad tracks, and, beyond that, Hayti. In 1957, the Central Carolina Bonded Warehouse began to use the facility for storage, which continued into the 1970s. In 1978, it was placed on the National Register for Historic Places. Mill No.1 as a flea market, 1981. Sometime around 1985, the mill buildings were renovated to provide subsidized housing for Seniors using Federal Section 8 funds. Controversy surfaced in 1989, when a former Acting Assistant Secretary of Housing, Shirley McVay Wiseman, said that Samuel R. Pierce, Reagan's Housing Secretary, called her in 1985 and told her to provide multimillion-dollar rent subsidies to the Durham Hosiery mills project in Durham, N.C. The part that made this rather interesting was that Pierce once was a partner in a New York law firm with Charles Markham, mayor of Durham in the early 1980s and a champion for the project. Evidently HUD staff had been vehemently opposed to the project, which would locate Senior housing 40 feet from a railroad track in a former industrial building that might contain hazardous material in an "unsafe, deteriorated neighborhood." Regardless of the propriety of the deal, the buildings were renovated as Section 8 housing for the elderly. They remain such today. While I've never been inside the buildings, they are, in my opinion, the most beautiful industrial buildings remaining in Durham. The brickwork on the tower alone is amazing. I'm certainly glad, through whatever means, these buildings were saved (I should have known that HUD/Housing wouldn't have done something this cool through SOP.) When I'm older, I'd much rather be here than in the vapid vinylness so often built by non-profits/public sector for Seniors today. The Hosiery Mill buildings are now surrounded by HOPE VI redevelopment, and the Golden Belt redevelopment across East Main Street.